So simple looking yet packed with an unreal amount of flavor, not to mention its perfectly thick consistency. It’s just the way I like my soup, creamy, cheesy and yummy. Cheddar cheese soup has always been a favorite of mine but when made at home it can often turn out lumpy. Cheddar has a tendency to clump together or get grainy when added to a hot liquid. 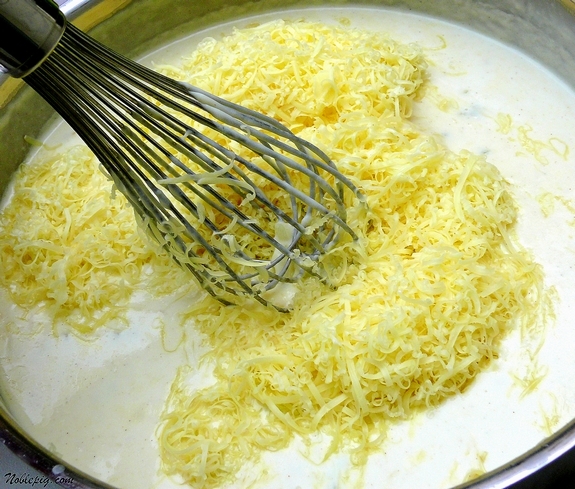 One way to solve the clumping issue is to grate the Cheddar finely and add it to the soup once it’s removed from the heat; do not boil the soup once the Cheddar has been added The cheese will melt easily and you will end up with an amazing meal. Using a good quality sharp, white Cheddar will yield the most flavor and you won’t believe what an incredible taste this soup has, it’s definitely company worthy. Serve some fresh baked bread on the side and you have the perfect meal. Try it, I promise you will love it. 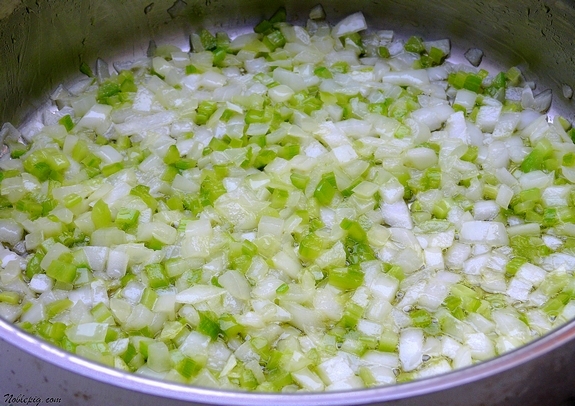 Sauté onion and celery in butter in a large pot over medium-low heat. Cook for 10 minutes; add garlic and sauté 1 minute more. Stir in flour to coat the vegetables. Add dry mustard, salt and white pepper. Stir constantly for 2 minutes to prevent scorching. Whisk in wine, the mixture will be clumpy, that’s okay. 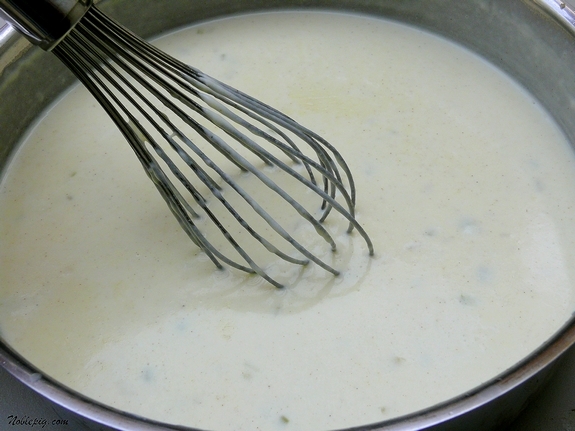 Then whisk in broth, milk and cream, scraping the bottom of the pot. Bring soup to a boil, reduce heat and simmer 15 minutes. Remove from heat and stir in cheese. Continue stirring until cheese is completely melted. Transfer to individual serving bowls and garnish with tomatoes and parsley. Serve immediately. I am definitely making this one once I get to the grocery store. I like the the green/red garnish against the soup…very striking. This looks wonderful and will likely be on my menu for supper tomorrow night! Thanks! Yummy. 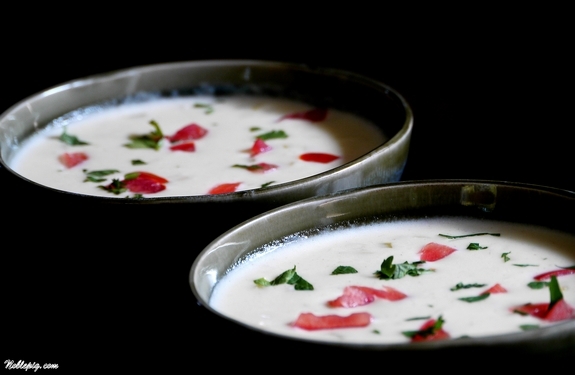 I love a creamy soup with lots of flavor. This one looks so cheesy, I would probably be able to eat the whole thing! My favorite is the Italian Wedding Soup that they sersve at Alonti’s in Houston. It is a chain, and they cater. The only thing is I would love to have their recipe. Do you have any idea where to get that recipe. “Alonti’s Italian Wedding Soup”??? I have tried to copy it at home, but never quite got it exactly right. Their ingredients are chicken, orzo, celery, creamy and cheesy, and seasoned with Italian seasonings. If you have any ideas, please post them! In the meantime, this cheesy soup will soothe my hunger for a good creamy soup. Ohhhh the creamy cheesy ooooeeeyyy goooeeeyyyy goodness! Lord. Have. Mercy. I want some now. Mmm…I have no doubts I would love that! Honestly, I’m afraid to make this soup, because I know I will become addicted. Actually soup is a wonderful way to use up the bits and ends of cheese that I keep in bags in my freezer. I agree with Lydia…I’m afraid I’d try it and become addicted to it. I love cheese so that is a distinct possibility. Wow, that is one gorgeous bowl of soup! I would love to make it while I still have a few fresh garden tomatoes on the counter…thanks for the recipe, as usual it’s great! Such a lovely soup! Thanks so much for the great tip with the cheese. On a cold, wet day like yesterday, this would have hit the spot perfectly! I’m thinking soup and a loaf just for myself would be the ultimate comfort meal! What an elegant lovely quick to put together bowl of pure delight!! Needles to say I love it! you know what’s silly? i hate orange cheddar cheese, but i could eat my weight in white. (speaking of white cheddar, is smartfood popcorn not the finest bagged snack ever?) great, great soup, cathy! Cheese and heavy cream…what’s not to love. Perfect for fall and the fantastic warm day, chilly night weather we’re having. Cheddar cheese soup is one of my favorites too. Great tip on how to make it more smooth and creamy — I’ll give it a try next time around. sounds so easy yet looks so delicious. One I’ll be trying! Oh, I know I’ll love it. Afterall, it has wine, cream, AND cheese! 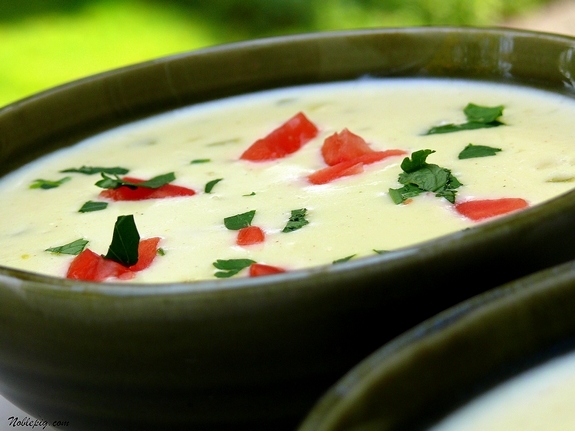 *swoon* This is so different from most cheese soups, and I just love what you’ve done. It looks to come together pretty quickly, too. YUM! I <3 this soup Cath. Oh yes indeed! Okay, I had a hunk of white Cheddar in the fridge and we mae this lunch. It was fantastic and so, so easy to put together! Thank you. I don’t doubt I would love this. Great idea to use white Cheddar–yummo! Oh wow. It looks heavenly. The tomato garnish sold me, although I don’t need much selling when cheese is involved (cheese whiz and velveeta excluded). How can it be that I have never had cheddar cheese soup? I must remedy that ASAP. Um, pretty sure you had me at CHEESE!! Mmmmm cheese. It’s starting to get wicked-cold ’round these parts and that soup would go beautifully with a loaf of hot crusty french bread right out of the oven! lovely garnishing! Looks so creamy and yummy! Sounds like an ideal fall soup. Looks delicious with the tomato and parsley too! Oh my that looks so good, especially as I look out my window at the gray windy weather. Just simply amazing Cathy. Thanks for the virtual tour. Loved it! Your White Cheddar Cheese soup is so appealing from a flavoring standpoint (who doesn’t love a creamy, cheddar cheese base, cut with a good white wine?) and a visual one too. The stunning contrast of creamy, white cheddar and bright, zesty tomatoes and parsley makes us want to dive right in! This recipe sounds quite delicious. I have never done celery and onions combined together in a soup, but think I may have too. Doesn’t even look like it would be too hard to make. Going to give this a try. Would be a perfect winters night dinner, especially with it getting quite cold lately. How well does this re-heat? would like to make and bring to work for a pot luck, microwave is the common source for re heating here at work. Is it going to be fresh after a few weeks?